Left to right: Joshua Han, Brandon Choi, Christen Capobianco, Matthew Gardner, Anna Park, Anna Shim. Photo from Project A Facebook page. Used with permission. Growing up, there is a sense of helplessness in most students when looking out into the adult world. They see the injustices of poverty, famine, and lack of opportunity in developing countries. They want to help, yet students, given their age, are inhibited from being able to provide meaningful support. Though many do volunteer for causes of their choosing, the age factor becomes a problem. It is only a minority that finds the motivation to exceed conventional expectations in high school and directly help those afflicted by misfortune. Gahr High School junior Anna Park, founder and president of her own nonprofit organization Project A, is part of this minority. Project A stands for giving aid, assistance, and assurance. “High school is just there to provide us with an education to get into college, and college is for us to gain knowledge for us to apply in the work force. Why should we have to wait until we grow up to do what we wanted?” Park said. 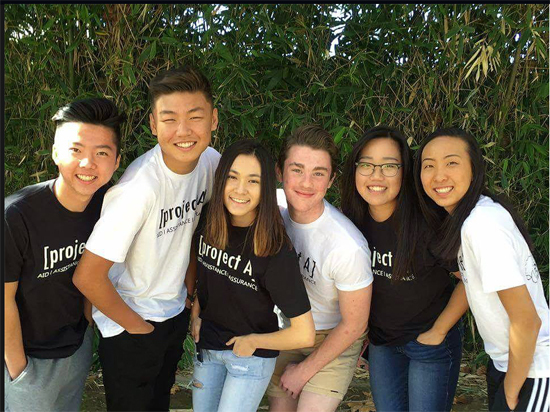 Project A gives students the ability to find a cause they feel strongly about, create an entirely new project to help the cause, and gather support from the surrounding high schools and communities to fund it. Ultimately, Park wants to promote individual growth through direct involvement with mission sites. The organization is entirely student run and over the past year, using the power of social media and word of mouth, has expanded from just the surrounding high schools (Gahr, Whitney, Cerritos) to Crescenta Valley, Fullerton, Glendale, Cypress, and Buena Park. Moreover, Project A has teamed up with the Playdough company and high school clubs such as Red Cross and Key Club to fundraise and spread awareness for its projects. In just one year, Project A has already managed to raise over $2,300 of a $10,000 goal for its “SOS Initiative,” a project funding the construction of a cement-block school in the Tiogala Village of Mali. The initiative was started in order to provide the approximately two hundred students in the village a better future. Additionally, Project A is currently planning a direct mission trip to the City of Angels Orphanage in Tijuana, Mexico for its “COM Project” to provide supplies such as toiletries, school supplies, socks, and toys, as well as direct fun activities for the children living there. In the near future, Park hopes to further expand her organization throughout the rest of Southern California and finish her existing projects. She does not want any student to feel restricted by his or her age from giving aid, assistance, and assurance to those in need. The world is a scary place, and Park strives to play her part in making it a little better.